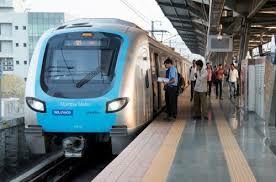 Metro is a rapid transit system serving the city of Bangalore, Maharashtra, and the wider MMR urban agglomeration. The system is designed to reduce traffic congestion in the city, and supplement the overcrowded Bangalore Suburban Railway network. Member of Group “A” Service of Government in JAG with 9 years’ experience or in SG with 06 years or working in SAG Grade. Appointment on deputation in case of Government Officers may also be considered. OR • Executives working in “CPSE/ PSU/ Autonomous Bodies” with 05 years’ experience in the E6 or equivalent grade with IDA pay scale of Rs 36,600 – 62,000/- (pre-revised) or with minimum 02 years’ experience in the E7 or equivalent grade with the IDA pay scale of Rs 43,200- 66,000/- (pre-revised). • Candidate must possess minimum 18 years of postqualification executive grade experience in Finance & Accounts in Metro Rail/ Govt. Organization/ PSUs. • Candidate must have working experience in area of Corporate Accounting, Financial Management, Multilateral / Bilateral Funding, Taxation – Direct/ Indirect, Treasury Management, Corporate Governance, Tender Evaluation, Vetting of Contracts/ Offers/ Estimates IND-AS implementation, Compliance of Companies Act, 2013. • The candidates from Private sector should have the working experience in a firm of repute with annual turnover of not less than Rs. 2000 crores and with a minimum CTC of Rs. 20 Lakhs. • Candidate must have at least five (05) years of cumulative experience at a senior level during the last ten (10) years, in various aspects of Corporate Financial Management and Accounts in an organization of repute. Minimum 09 year’s post qualification executive grade experience with 04 years’ experience in next below grade in IDA pay scale of Rs. 29,100 – 54,500/- (pre-revised) or · Total minimum 09 years’ post qualification executive grade experience with 04 years’ experience in next below grade of executive in state government; or · Candidate must possess minimum 09 years of post-qualification executive grade experience in Finance & Accounts in Govt. Metro Rail/ Govt. Organization/ PSUs. · Candidate must have exposure / working experience in area of Corporate Accounting, Financial Management, Multilateral / Bilateral Funding, Taxation – Direct/ Indirect, Treasury Management, Corporate Governance, Tender Evaluation, Vetting of Contracts / Offers / Estimates IND-AS implementation, Compliance of Companies Act, 2013. · Candidate must be conversant in various aspects of Corporate Financial Management and Accounts in an organization of repute. · Candidates working in Private sector must have a minimum 09 years’ post qualification experience in executive grade in a firm of repute with annual turnover of not less than Rs. 2000 crores and in a minimum CTC of Rs. 12 Lakhs in “desirable” domain for the post. Executive Assistant to Executive Director (Planning) Job postJr. Scale officer having total minimum 05 years of service with Grade Pay of Rs. 5,400/- (CDA); or · Officer currently working in Sr. Scale (Rs.6,600/- (CDA) or IDA pay scale of Rs. 24,900 – 50,500/- (pre-revised), with minimum 02 years post qualification experience in “desirable” domain for the post; or · Total minimum 07 years of post-qualification experience in Executive grade in Government entities in “desirable” domain for the post; or · Total minimum 07 years of post-qualification experience in reputed Private sector in Executive grade in “desirable” domain for the post with minimum CTC of Rs. 08 Lacs. Employees of Central Govt./ CPSU, State Govt./ State PSU’s in the Grade Pay of Rs. 4,800/- and above with minimum 10 years of post qualification experience in Finance & Accounts department. or Employees in equivalent IDA Scale of Rs. 18,500 – 35,600/- (Pre-revision) with minimum 10 years of post qualification experience in Finance & Accounts department. Sr. Supervisor having total minimum 04 years of service with Grade Pay of Rs. 4,600/- or · Officer currently working in Jr. Scale with Grade Pay of Rs. 5,400/- with minimum 02 years’ experience in “desirable” domain for the post; or · Total minimum 04 years of experience in Supervisory grade of Rs. 18,500-35,600/- (pre-revision) in IDA pay scale with minimum 02 years post qualification experience in “desirable” domain for the post; or · Total minimum 04 years of post-qualification experience in Executive grade in Government entities in “desirable” domain for the post; or · Total minimum 05 years of post-qualification experience in reputed Private sector in Executive grade in “desirable” domain for the post with minimum CTC of Rs. 08 Lacs . Sr. Supervisor having total minimum 04 years of service with Grade Pay of Rs. 4,800/- or · Officer currently working in Jr. Scale with Grade Pay of Rs. 5,400/- with minimum 02 years’ experience in “desirable” domain for the post; or · Total minimum 04 years of experience in Rs. 18,500-35,600/- (pre-revision) in IDA pay scale with minimum 02 years post qualification experience in “desirable” domain for the post; or · Total minimum 04 years of postqualification experience in Executive grade in Government entities in “desirable” domain for the post; or · Total minimum 05 years of postqualification experience in reputed Private sector in Executive grade in “desirable” domain for the post with minimum CTC of Rs. 08 Lacs.